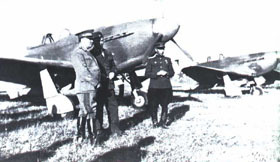 After the arrival of the Soviet 17th aviation army to Yugoslavia and after giving over two aviation divisions, Yugoslavia among others, got also 3 Jak-3 aircraft (one was in the 168th guard, and two in the 267th fighter regiment). These aircraft were flown almost exclusively by the Soviet regiment commanding officers or by their deputies. The first of our pilots who flew of Jak-3 on the Sremski front was commander of our 112th fighter regiment, and later on flew it also the Commander of our 113th fighter regiment, flight-lieutenant Miljenko Lipovscak and flying officer Stanko Forkapic. Some texts in the press, due to inaccurate record, quote that in Yugoslav Air Force there were five Jak-3 in total what is wrong The last war mission on Jak-3 performed the pilots of the 113th regiment - Lipovsak and Forkapic, on May 15, 1945. Jak-3 in the post. war period according to the agreement between Yugoslavia and USSR dated February, 1945 it was agreed that the Yugoslav aviation units would be supplied with the new Soviet equipment. The first delivery, according to this agreement, was made at the end of June, when at Zemun airport landed 28 Jak-3 aircraft. During July these aircraft were disposed to all three regiments of the 11th fighter division: 111th got 10 aircraft, 112th regiment 10 aircraft, and 113th got the rest of 8 aircraft. At the beginning of October, Jak-3 number 97 (no. 9746-one of this lot. ), while performing combat target shooting in a dive lost the wing covering of about 2 square m from the upper wing surface. The pilot, Josip Jirasek managed to bring the aircraft under control and to land safely. Besides these aircraft, on September 14, Yugoslav Air Force was reinforced with one regiment of armed Jak-3 aircraft. After the seven days ferry flight from USSR, at the Zemun airport landed 40 Jak-3 aircraft of the 254th fighter regiment which was according to the agreement made between Yugoslavia and USSR, fully equipped and trained in Krasnodar (USSR). After few days in Zemun, the regiment was transferred to Mostar, where it becomes a part of the new formed 3rd aviation fighter division together with the 112th fighter regiment, which had been transferred to Mostar somewhat earlier. Because of the critical situation on the Italian border and because of the unreported overflying of foreign aircraft over the north-west parts of Yugoslavia, very soon the 3rd division was transferred to the first combat line at the Ljubljana-Polje aerodrome. As early as July two aircraff of the 254 regiment successfully intercepted one unreported C-47, but it flew into clouds and escapes. One month later (August,9) again the aircraft with pilots lieutenant Dragomir Zecevic and Dragan Stanisavljevic, from the same regiment, succeeded in shooting down the American C-47, which had overflown the Ljubljana airport at 12.50. For the sake of a more efficient interception one flight from each regiment of the 3rd division was redistributed to the alternative aerodrome near Radovljica. From this alternate aerodrome a fighter pair took off on September, 19 with pilots Vladimir Vodopivec and Milorad Knezev, intercepted a C-47 and after several warnings, they shot it down. After this intervention the airspace violations on this part of the border stopped, so the whole 3'd division was pulled out to Mostar. However, the similar incidents occurred on the southeast border of Yugoslavia. During this unsettled 1946 the total number of Jak-3 was reduced for 7 aircraft. Because of the complications on the Yugoslav-Greek border caused by the civil war in Greece, in April 1947 in Skopje was formed the 5th fighter division with a task to defend the borders towards Greece. This division was made up of the 11th fighter regiment from Skopje and the 113th fighter regiment which was specially for this reason transferred from Ljubljana so that the both regiments had one squadron each, equipped with Jak-3 aircraft. On the request of the Albanian general staff, the 113th regiment overflow Albania and from June 12 till September, 21 was defending its airspace. In autumn 1947, after returning to Yugoslavia, Jak-3 aircraft from the 113rd regiment (and the rest of the 5th fighter division) were based on the airfields near Strumica, Bitola and Kavadarci in field-like conditions. At the end of 1947 and at the beginning of 1948 from the both regiments of the 3'd aviation division were withdrawn, due to excessive armament, almost all Jak-3 were handed over to the regiments of the Skopje division. A certain number of Jak-3 was handed over to the 2nd aviation training regiment of airforce Training center in Pancevo (for training purposes of the regular forces), as well as the training center for specialists) for training purposes of the aviation-technical personal). It is interesting that some of this Jak-3 from the specialists training center, after spending several years on the platform, were put in working order and they actively joined the flying unit. According to the agreement from 1945 the fighter units should have been regularly supplied by Jak-3, till the breach with USSR in 1948, however, no Jak-3 had been delivered except those in 1945. The lack of spare parts and worn out condition of these aircraft due to being on permanent duty, lead to high drop out of the fighters. In 1949 Yugoslav Air Force had only 48 Jak-3. At the end of 1949 for division reinforcements of two fighter regiments were formed: 198th in Skopje and 204th in Zadar. For he forming and reinforcement of the 198th regiment, man and Jak-3 aircraft gave the 116th regiment, and for the forming of he 204th regiment from the 101st training regiment some Jak-3 were supplied. By the coming of S.49A the remaining Jak-3 are being transferred mainly to the regiments of the 39th division, which in his way remain the only fighting regiments equipped with Jak-3. It is interesting that on Jak-3 during 1950/51 the 198th regiment was performing night combative training. Eight pilots from the regiment were trained for this purpose. During the next three years the remaining number of about 30 aircraft were successfully used in training regiments till the beginning of 1957, when they were written off. Thus to Rajlovac, for the needs of the Aviation Museum, Jak-3 serial number 2252/52 and factory number 8543 was given over and afterwards included to the collection of the Museum of the Yugoslav Air Force in 1962.